MyTribe:GOAD has “digitally colonised” the centre of the National Museum of Australia with more than 100 Mobile Augmented Reality Journeys containing over 500 pieces of original media reflecting personal responses to the space. Here are some examples of the works that were produced with themes of family, memories, ancestory, culture, current events, holidays, immigration, and even detention. 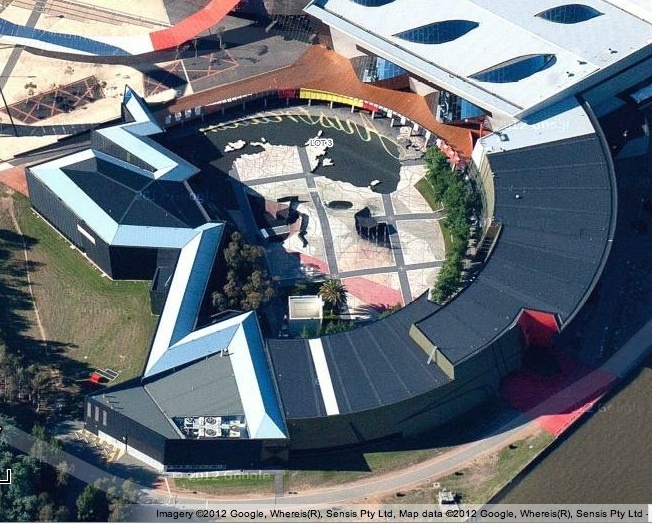 The Garden of Australian Dreams (GOAD) is a walk-through map of Australian geography, culture and history located outdoors in the central courtyard of the National Museum of Australia. The map contains layers of graphic, sculptural, architectural references to Australian history and culture. There are also conceptual references such as the word “home” written in different languages, and the choice of European oaks to represent colonisation and immigration. There is no signage or explanatory text because the GOAD has been left purposefully open to interpretation. These MyTribe: Journeys through GOAD add an augmented reality layer of interpretation to the already layered symbolism in the space, and demonstrate the potential to take the NMA motto “telling our stories” to a new level of social participation and contribution. This commons-based peer-production by 150 students in Cross-media at the University of Canberra in 2012 was a contribution to the MyTribe:Journeys call out on ABC Pool to educators in the media arts across the country. MyTribe:GOAD has demonstrated the potential for storytelling with geo-located mobile media in an outdoor space. Through the development of the prototype we have learnt about the opportunities and constraints of geo-located mobile media and technologies. For example the resolution of GPS on a mobile phone is about 50m, which limits the separation of the hundreds of items geo-located in the 200m x 300m area of the Garden of Australian Dreams. The Layar browser has a minimum range of 100m so media can only be placed roughly in this range, and cannot be placed specifically on particular objects or symbols. When there are large items, or many items, there are long delays as the media download to the phone over GSM networks. Finally it can be difficult to see the small images and text on a mobile phone screen, especially in the glare of a sunny day. We are currently documenting and analysing the knowledge gained through this teaching led research project by writing a chapter for a book tentatively titled Evaluation, Public Art and HCI that is currently being put together by the Creativity and Cognition Studios at UTS. Some of the students have gone on to further creative projects based on their learning in this unit, such as a site about graffiti art in Canberra, a site about outdoor exhibits at the Australian War Memorial, and an app called the People’s Map of the Northside ACT.